Home Off Beat	Walk in the rain with a coffin umbrella! Walk in the rain with a coffin umbrella! You’re going to love these newest and trendiest umbrellas which have a unique, funky design of coffins on them. These big umbrellas in white and black will get you noticed at once whether you use them in rainy season or in sultry weather. 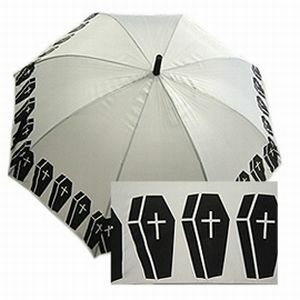 These umbrellas measure 33-inch and open up readily with the ‘popup’ button and have an array of coffins at the rim. Well, if coffins turn you away then you can try on skull umbrella that has skulls scattered on its base in a white or a black background. Owning one of this unusual umbrella at just $14.95 seems a nice bargain to me. Imagine walking in the rain with your partner, hands in hands, under this umbrellaâ¦ doesnât it sound romantic? Lurid 'bird nest' ashtray & lighter combo! The ultra-gory 'Chopper Zombie' bike!